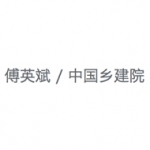 来自 傅英斌（联系邮箱：fuyingbin999@126.com）对gooood的分享。 更多关于：Fu Yingbin on gooood. When Hou Zhongmao died, he was less than twenty years old. Where is he from? Is he married? Does he have any siblings? Does his family know his death? None of questions we were able to answer. The cemetery of this young soldier is one example of many other cemeteries of the Chinese Red Army during their Long March in Guizhou province. 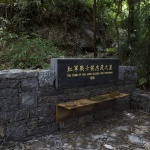 He was buried on the road of the Long March. More than 80 years ago, the epic Long March shocked the world and created an immortal chapter in the history of the Chinese revolution. However, these soldiers who silently dedicated their young lives have formed the red ribbon on this earth. We try to trace the individual values and rethink the nature of history by designing this tiny cemetery of an ordinary red army’s soldier. 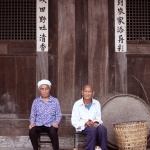 Zhongguan Village, Tongzi County, Zunyi City, Guizhou Province is located in the deep mountains. The famous Battle of Loushanguan during the Long March was 12 kilometers southwest of the village. An army who was responsible for the ambush in the battle of Lushanguan passed through the village while a sick young soldier was left in the village. The villagers gave food to the soldier. Unfortunately, a year later, the Red Army soldier passed away and the villagers buried him in the fields of their own hillsides. This lonely grave has been watched on the hillside for 80 years. 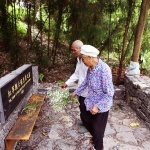 Until a new round of rural construction in 2016, people once again noticed the remains of Long March in the village. 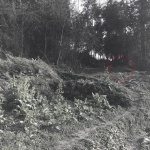 After investigating, the only person in the village who knows the story of the Red Army Cemetery is over 80 years old. His father used to take care of the soldier and buried him after his death. 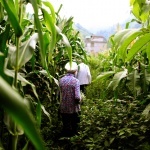 The old man took us to the grave where hidden in vegetable fields of the hillside. At this time, this grassy cemetery has almost disappeared. We cannot help but wonder what kind of life this young man had experienced? When the young soldier was buried in a land far from hometown, how would his relatives, comrades and lover feel? Can someone still remember him in these 80 years? We decided to design a cemetery that dedicates to the ordinary Red Army soldiers. This idea is very different from the “Martyr’s Grave” that many others would expect. After thinking and designing, our ideas have finally been implemented. The theme of the environment determines the nature of space. The nature of space determines the spatial sequences. The most important thing in the commemorative space is to express historical facts and convey the designer’s understanding of the spiritual connotation of historical events. 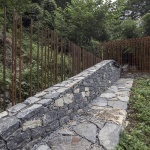 The material space of the landscape is to build a dialogue between the designers and visitors. The design of this Red Army Grave mainly shows two aspects, one is the historical fact of the Red Army and Long March. 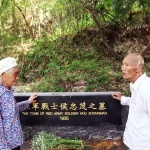 The second is the memory of Hou Zhongmao, an ordinary soldier who died of illness in the war. 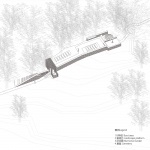 The landscape design of the Red Army Cemetery aims to integrate the surrounding environment. By setting a humanistic scale, the significance of the commemorative landscape is carried out by a horizontal extension rather than creating an oppressive sense in the vertical direction. The cemetery that can be seen in a far distance is only half of the steel pavilion. Other parts are hidden in the hills and fields. 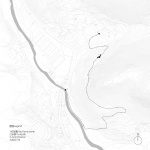 The whole project has a long field path, connecting various landscape nodes. This 2.5km long road is not flat, but bumpy. It is a symbol of the Red Army’s 25,000-Li Long March. 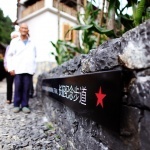 By setting 18 steel panels along the path as the signage, the visitors are able to see the important events ranked by time in the Long March. 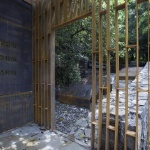 The Hou Zhongmao grave is a spatial climax. 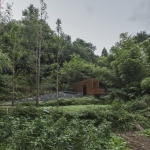 The dark reddish-brown weathering steel pavilion stretches out from the hillside. 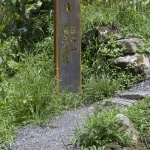 When the visitors walk on the path, they act as visual icons and banners, guiding the direction of walking. In the design of the Red Army Cemetery, only two materials, stone and weathering steel, were used. Stone is the most common material in the area and it can be well integrated with the context. The weathering steel has a dark reddish brown color by the time, which has a sharp contrast with the green background. As we approaching the grave, a stone wall runs through the entire cemetery. The stone wall slowly rises from the ground and gradually returns to the ground, symbolizing a small wave in the entire historical river. A young life had ever struggled, but it disappeared silently. The rusted steel pipe array combining with the stone wall at the entrance is like the numerous unnamed Red Army soldiers, who gave their lives in the Long March. 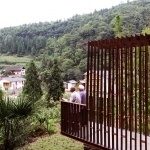 The landscape pavilion is a square block composed of steel grids. It can be seen in different states from different angles. When the pavilion dims in the woods, it likes a flag with slow wind in battle and it also represents the fate of mankind in war. Different visitors can have different understandings. 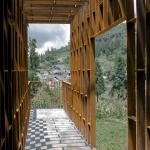 The height of the landscape pavilion is only 2.8m and the width is 1.2m. It is suitable for one person or two people to stay, think and talk. 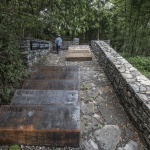 The landscape pavilion is not only the entrance to the cemetery, but also the place looking to the village and forming a dialogue between history and the present. 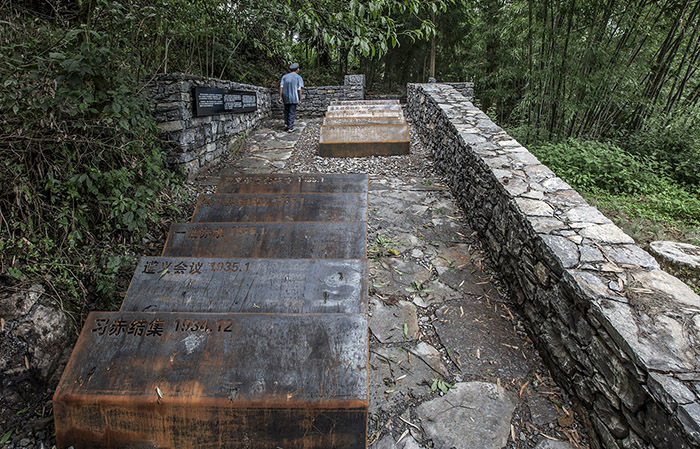 Passing through the landscape pavilion is a commemorative area, the weathering steel panels record the events in the Long March related to Tongzi. The side stone wall records the story of the young soldier and his stories. Visitors can learn about history and feel the past time. A preserved mountain peach sticks out from the back side of the stone wall. In the spring, the white petals fall with the wind and cover this small path. The last space is the cemetery area. The designer keeps the current condition of the Red Army grave. The grave has not been trimmed. A low stone wall has been added in front of the grave combing with the tombstone. The tombstone is not vertical, but horizontally placed on the stone walls. The height is below the line of sight. The grave covering with grass has a sharp contrast with the new masonry tombstones in front. The visitors do not need to look up. This will put the ancestors and the present world in the same space and the same dimension. It will make people feel the Red Army soldiers that passed away. Like us, they used to be living life. The path in the cemetery is the largest part. The length of the path is about 2.5km, but the width is only 0.6m. It is reconstructed on the basis of the natural path that the villagers walk daily in the field. The gravel and the necessary steps are made, and the other parts have been kept as origin. From a local point of view, the 0.6m wide path is a small scale, and even slightly narrow. 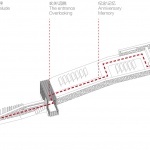 From a holistic point of view, the 2.5km walking path is also a large scale. It is long and tortuous. It is just like the hardship and longness of the Red Army’s Long March. There are different scenery changes in the four seasons in the field. The golden rapeseed flowers are in full bloom in the spring, and the corn is planted in the summer and autumn fields. The visitors walk through the green yarn as if they were marching in the past. After the completion of the Red Army Cemetery, the old man who had seen the Red Army and guarded the grave for 80 years deliberately came to visit, and he cries in front of the grave. Visitors also admit this is a different “Martyrs Cemetery” experience. The person who once lived in this village, his existence actually represents ordinary people who are as silent as he is for the peace of the country. This is exactly what designers want to express about the “humanism” of war. Respect for life, emphasize the value of each individual’s existence, and have progressive significance.